Turn any Mirco-USB cable into a USB-C compatible one. 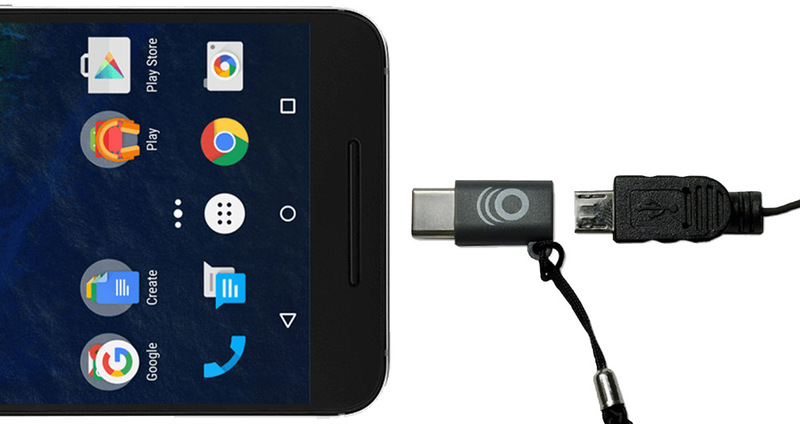 Brings your Micro-USB cables back to life by converting them to be USB-C compatible. Slim design is easy to use and carry. Plays well with others! Simple, minimal adapter converts Micro-USB signals to make them USB-C compatible. Oh you fancy, huh? Compatible with the latest, USB-C tech like the MacBook, ChromeBook Pixel, & Galaxy S8. Warp speed engaged: USB 2.0 protocol supports Qualcomm Quick Charge, and crazy fast data transfer (480 Mbps). Comes with a braided strap that can connect to your work bag or key chain, so you'll never be without USB-C connectivity. Built to last, the durable design will keep your devices working as hard as you do. Click the button below to add the Micro USB to USB-C Adapter to your wish list.